Julie’s interest in health and nutrition has been a lifetime commitment. As a long time competitor in sports, nutrition for performance was always a focus. She studied science and nutrition in college and earned a degree in Psychology from CU Denver. 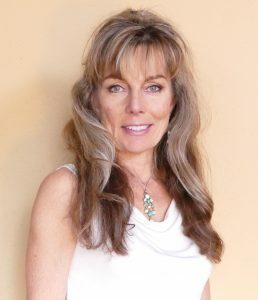 She’s also a Nutrition Educator, having completed a 350-hour holistic nutrition training course from Bauman College in Boulder while researching her book. 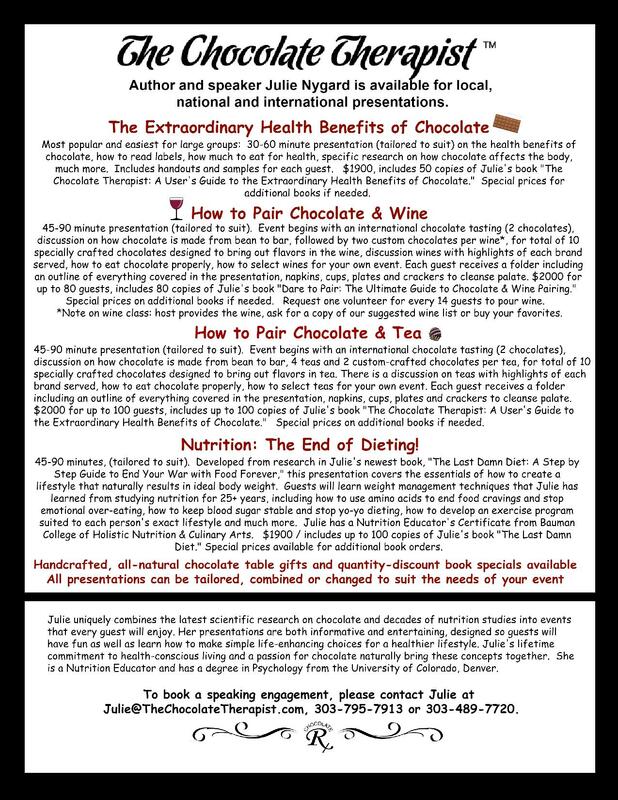 Julie speaks regularly about nutrition and the health benefits of chocolate to groups of all kinds, including corporations, women’s groups, men’s groups, breakout sessions, keynotes, private parties and charities. Julie worked 12 years in the wholesale sporting goods industry before leaving her management position to launch her own corporate apparel company. She sold it five successful years later to follow her dream of becoming an author. 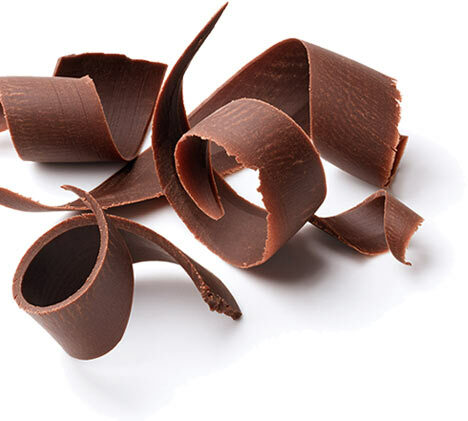 When the health benefits of chocolate news broke, she knew immediately it was the perfect topic for her. She’s made it her personal mission to change the chocolate-loving as we know it, one convert (to dark chocolate) at a time. 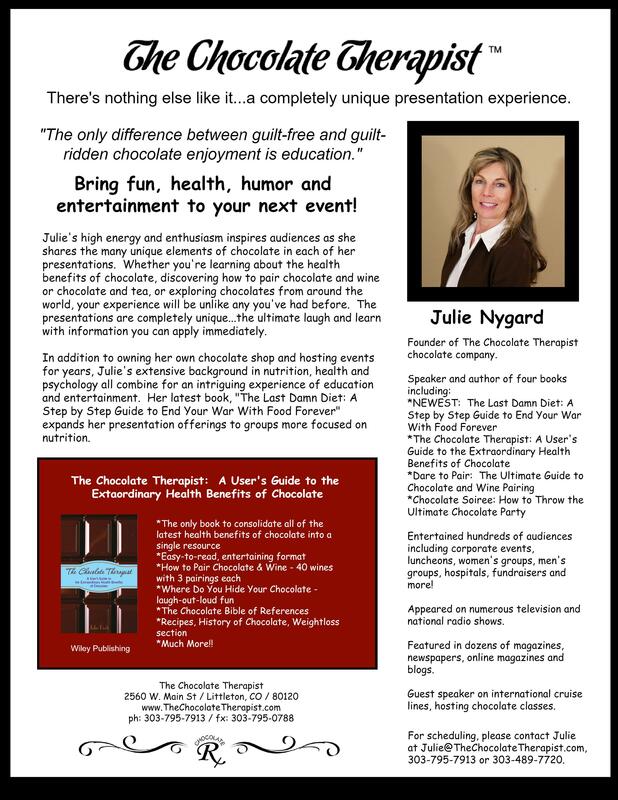 To schedule Julie at your event, please fill out the form on the contact page. A percentage of every item sold benefit children’s programs all over the world including hunger, education, clothing, abuse, abandonment, and more.